This is my fourth quilt, and I keep finding myself preferring the backs. You know, the side that didn’t take all that work cutting and piecing and pressing, and I keep liking it better anyway. 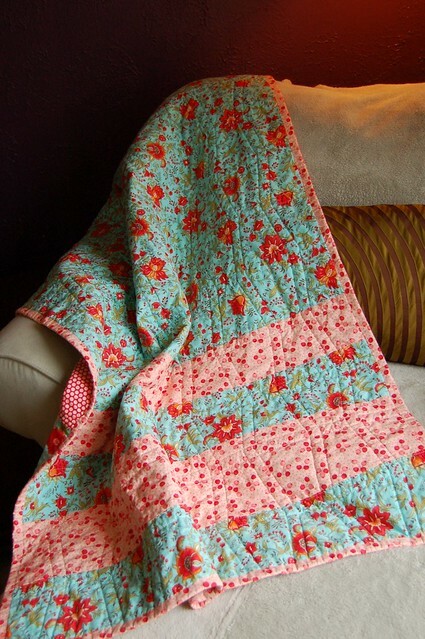 I may need to make a very plain quilt to keep for myself. Fabrics are Bliss by Moda. Thank you! I really like the way the tumbler shapes seem to give it a sense of motion. I’ll end up making another tumbler quilt sometime. you said three packs of charms equals a lap quilt? i’m trying to estimate how many charms i’d need for a twin sized quilt. Hi, Laurel! Charm squares are 5″ square, so if you use a quarter inch seam allowance your finished squares will each be 4.5″ squares — less if you trim more off to make tumbler blocks. 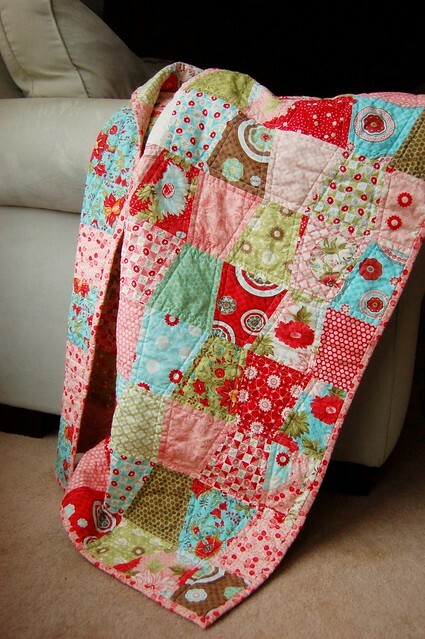 But I still wasn’t sure how many you’d need for a twin quilt, so I did a little searching and found this post for you: http://crazymomquilts.blogspot.com/2009/12/how-to-calculate-quilt-measurements.html Lots of helpful info there! According to Crazy Mom Quilts, you’ll need 280 charm squares.